The Hero Factory is a new area you can actually build with some LEGO stuff. Mik thought it was cool the seats all swung out so you could move them out of the way for him to wheel up to the table. 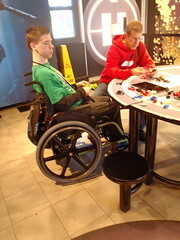 However, the Hero Factory line is just the new Bionicles and he finds them frustrating and not as fun as actual LEGOs. I for one was glad when he grew out of liking Bionicles because I share the dislike of how hard it can be to snap the pieces together, him having them fall apart easily when playing with them, and me having to put them back together again.